Sometimes, when you cook a recipe, it all just falls perfectly into place. Everything works exactly as it should, at exactly the right time. Sometimes, though, fate plays a different hand, and nothing pans out quite the way you want. So it felt with this cheesecake. It’s years since I’ve made a cheesecake, so I decided now was the time to try again. The recipe in The Prawn Cocktail Years had never really appealed to me, mainly because it includes sultanas. I’m really not such a big fan of dried fruit, so I’d always passed this one by. Well, I could ignore it no more. Time to make cheesecake. Sue’s out for the evening, and I’m in on my own. I potter about in the kitchen for a little while first and then decide I really ought to get on with things. First the sultanas. They need to soak in hot water and a little rum. We have some very nice rum that we brought back from Tenerife, so I used that. Next the pastry. This pastry is made with curd cheese – no other fat, just curd cheese. That’s not like any pastry I’ve made before, but it sounds reasonable. 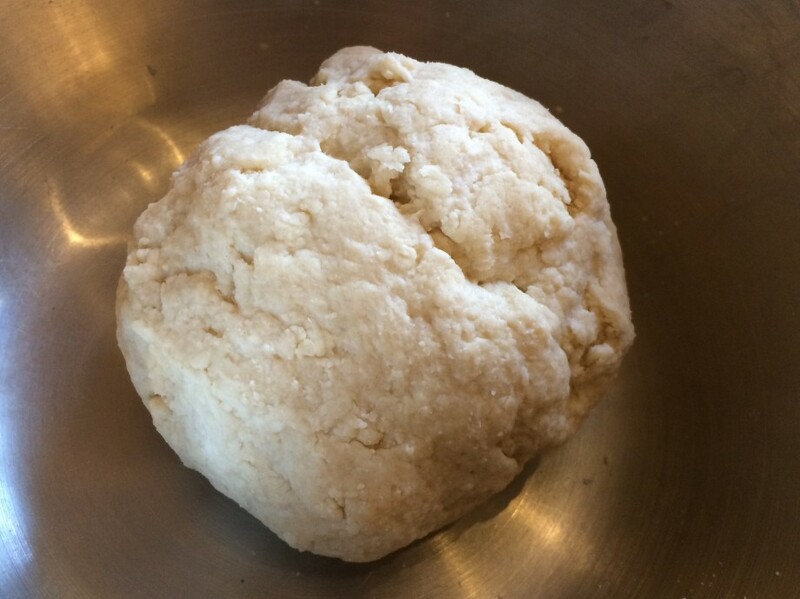 It’s made just like any other pastry – sift flour and salt into a bowl, rub in the cheese and sugar, then add water to bring it all together. Then the instructions said, “chill in the fridge for 30 minutes before using”. I wrapped the pastry in cling film, put it in the fridge, turned the oven on to preheat and wandered off to my computer for a bit whilst I waited. An hour and a half later, I remembered about the pastry. It was now late evening. Sue would be home soon and I’d barely started. If I carried on, it would be well into the early yours of the morning before the cheesecake was cooked and then cool enough to put into the fridge. I decided to abort. I turned off the oven and put the soaking sultanas into the fridge along with the pastry. 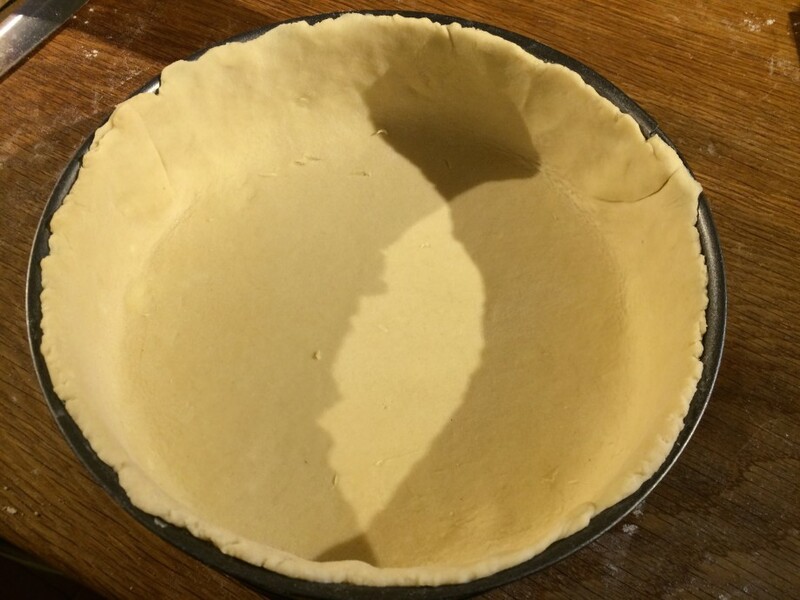 Surely the pastry would keep until tomorrow. The next evening I resumed. The rest of the cheesecake recipe looked pretty easy and I figured I could make the cheesecake whilst dinner was cooking. Thai Green Curry was tonight’s meal. I needed to bake the pastry case first, so I decided to get that in the oven before I started on dinner. I rolled out the pastry and lined my cake tin with it. Then, I covered it with a sheet of foil and poured some uncooked chick peas in to hold it down. That was baked for twenty minutes, then I removed the chick peas and foil, brushed the base with egg and put it back in the oven for another ten minutes. When it came out, it didn’t look bad at all. The very top edge of the crust looked a bit overdone, but other than that it seemed pretty good. Whilst the pastry was in the oven, I had been busy getting dinner ready, and a pan of chicken curry was simmering gently on the stove. That should be quite happy sitting there while I prepare the cheesecake filling. 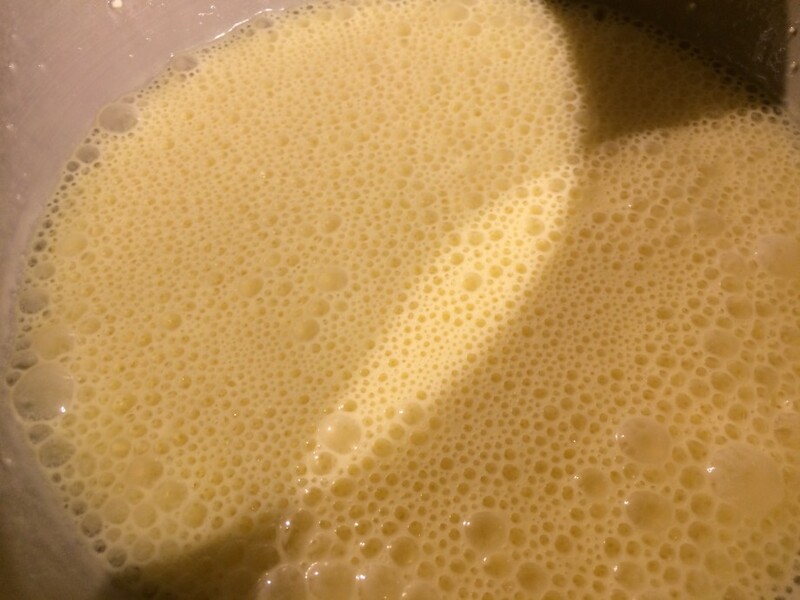 The instructions for the filling are very straightforward – beat curd cheese, sugar, potato flour and salt until well blended, then whisk in eggs, one at a time, until “the mixture has increased in volume and is thick and fluffy”. Well, I whisked and whisked and whisked. At no point did the mixture even look like it might one day contemplate getting just a little thicker. There was no way this was ever going to get thick and fluffy – thin and runny was, it seemed, the best I could hope for. I decided to carry on regardless. Next, I grated lemon zest. It was just after I’d stirred the zest into the mixture that I realised I’d grated it onto the chopping board that I’d been chopping garlic on just a few minutes earlier. Oh well, a little garlic in your cheesecake can’t hurt, I guess. 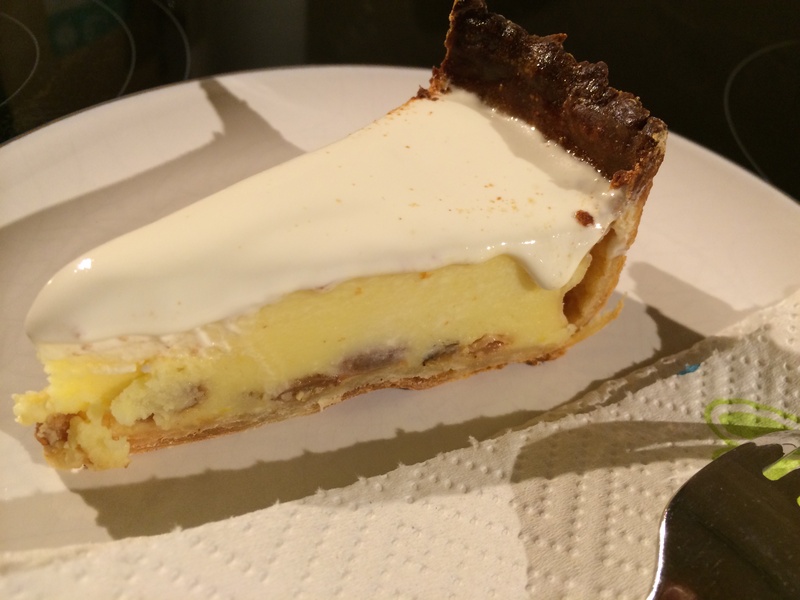 I added the sultanas, stirred well then poured the thin, eggy soup into the pastry base. I put it in the oven, hoping for the best, and started getting the rice ready for the curry. The rice was half cooked when I remembered that I’d forgotten to dust the top of the cheesecake with nutmeg. I retrieved it from the oven and started grating nutmeg over the top. I’m not really sure quite what happened next, but somehow the half-grated nutmeg leapt out of my hands and plopped into the cheesecake. The filling was still completely liquid at this point and the nutmeg sank without trace. After a little poking about with a spoon I finally retrieved it. I finished grating and returned it to the oven. After finishing eating the curry, I took the cheesecake out of the oven. It looked OK – it was set, and looked nicely done. 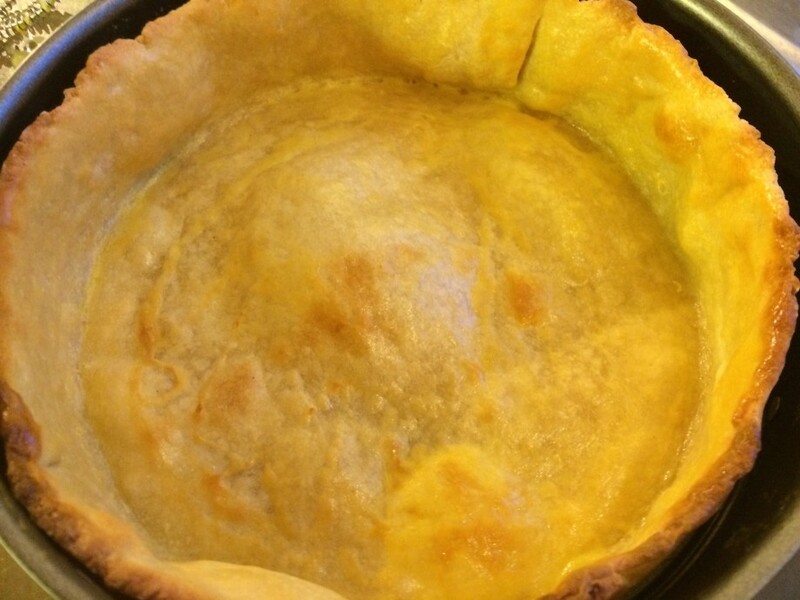 The pastry edges were a bit over-brown, but that seemed a minor detail. I put it back in the oven, turned the oven off, and left the door ajar while it cooled, exactly as instructed. Once the cheesecake was cool, I removed it from the tin and put it in the fridge. It was time for bed. The next day, we were ready to actually try the cheesecake. 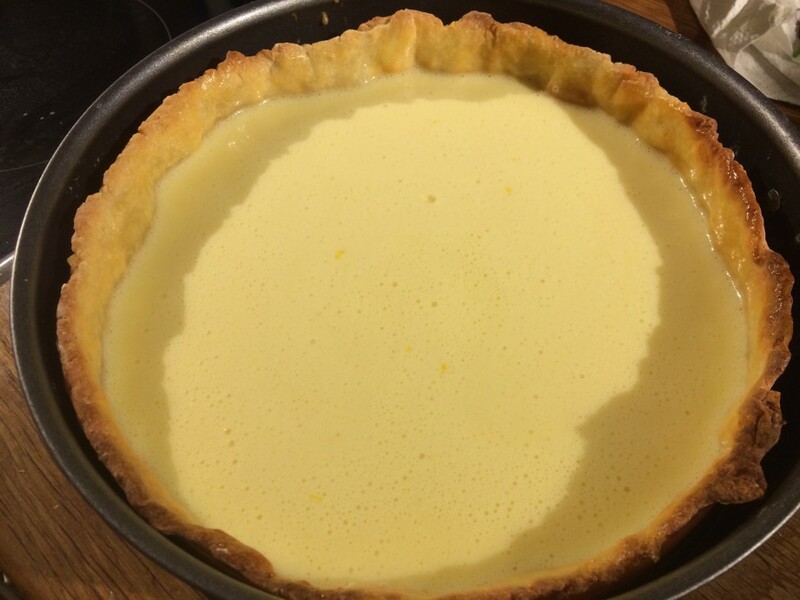 The recipe calls for soured cream to be spread over the top. That sounded a bit odd, but I went with it. I took a knife and cut into the cheesecake. Hmm. This wasn’t quite right. I couldn’t get the knife to actually cut through the pastry. That “slightly overdone edge” was rather harder than I thought could be possible. My nice sharp knife was having no impact on it whatsoever. In the end, I had to saw away with the bread knife to get through it. The filling itself was actually really nice. Even the sultanas were pleasant. I can’t say the same for the pastry. It varied in texture from an impossibly hard concrete-like substance at the edge, to overly chewy shoe leather in the middle. The pastry was inedible. The chewy bits from the middle had a nice flavour, but eating them was very hard work. Attempting to eat the outer parts would undoubtedly result in expensive dental work. In the end we both gave up on the pastry and just scooped the filling out with a spoon. I don’t really know what went wrong with the pastry – perhaps leaving it in the fridge for a whole day was a bad idea. I’m surprised it was this bad though. Oh well. I love cheesecake, but I doubt I’ll attempt this particular version again. I’m not sure I’ve had a baked cheesecake before. Perhaps at someone else’s house, but I’ve not made one and none of my family have either. 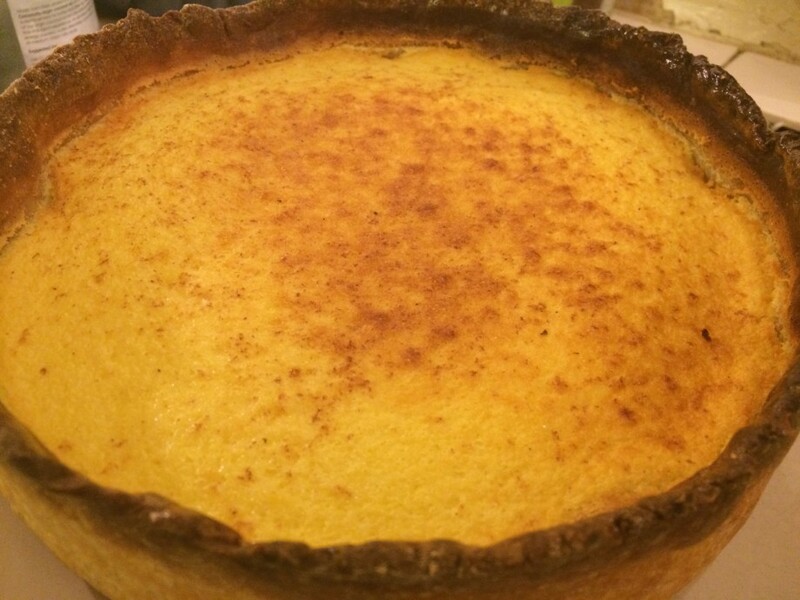 When I first saw it out of the oven it looked like an egg custard to me. Golden and with nutmeg on top (I love nutmeg). But the prominent raised pastry edge was very overdone, a dark, dark brown. To serve the cheesecake Dave topped it with sour cream. Taste: lemony and creamy. 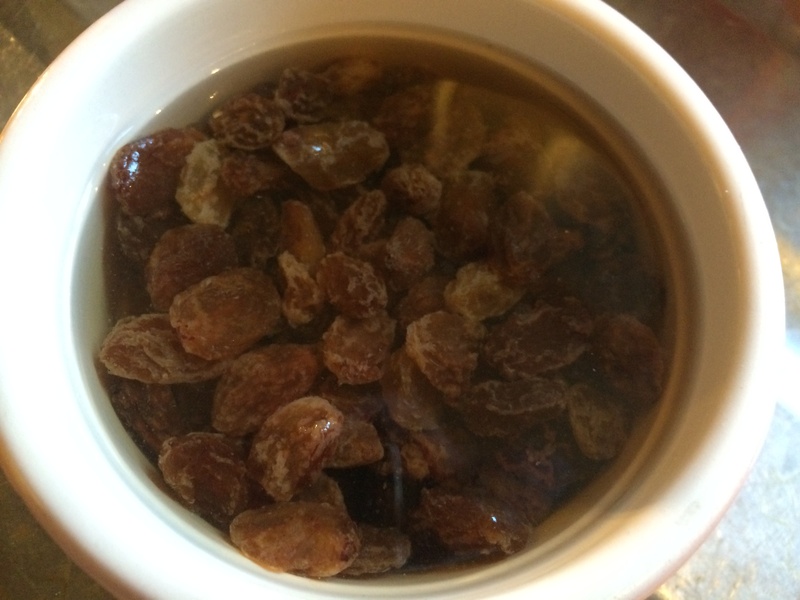 With sultanas soaked in rum to plump them up. Very good, although the sultanas all sank to the bottom. Texture: an odd one to describe. Creamy yet firm, smooth yet slightly grainy. 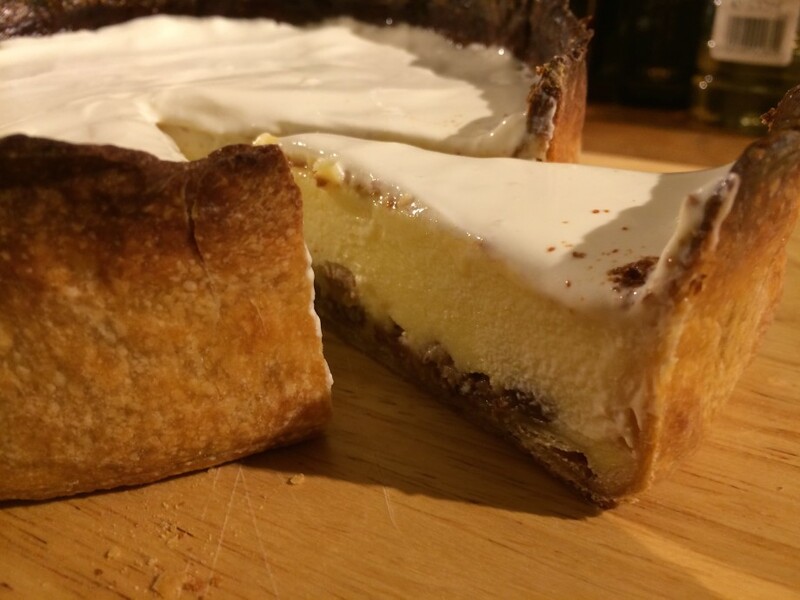 It takes some chewing, unlike an unbaked cheesecake. I really like the filling. It’s a great dessert. However, there is a problem with this dessert. The pastry is doing a double act as a receptacle to hold the contents, rather like a shoe holds a foot. And the analogy to shoes and therefore leather is a good one. The pastry is pretty inedible. You literally have to saw through the crust with a bread knife and although the base isn’t that hard, it’s tough and chewy and best just left on the side. With a warning about not dropping it on your foot. The would be a delicious recipe, but the pastry lets it down.